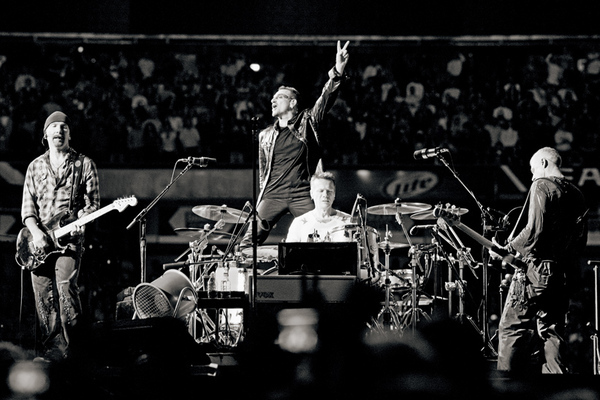 Hope you caught U2 360° live from the Rosebowl, Pasadena on YouTube tonight. And now we can reveal that U2 360° is coming back to North America in 2010. The tour will touch down next summer in Anaheim; Denver; Oakland; Seattle; Edmonton; East Lansing; Miami; Philadelphia and Montreal. U2 360° will also return for one night only in Toronto and Chicago before finishing the North American leg in New York at the New Meadowlands Stadium. On U2 360° the band currently play 22 live tracks, the first time fans have heard tracks from No Line On the Horizon, one of the best selling albums globally this year..
You can find the complete list of North American cities, venues and dates on our Tour Page.. Tickets for the performances in Oakland, Edmonton, and Toronto will go on sale Monday November 2 with additional North American on sales taking place over the following few weeks in November. (Tickets are also about to go on sale for 2010 European dates in Athens, Greece and Istanbul, Turkey. As always SUBSCRIBERS TO U2.COM are able to buy tickets ahead of the general public in special presales - the first of these open this week. As well as the chance to buy up to four tickets in the presale, U2.com subscribers will be sent a limited edition U2 remix album and gain unique online benefits with access to the dedicated U2.com subscription site. All the details on the U2.com subscription here.